Rifapentine, a long-acting semisynthetic cyclopentylpiperazinyl derivative of rifamycin SV, is an ansamycin antibiotic. Rifapentine is a lipophilic compound that is similar structurally and pharmacologically to rifampin and rifabutin. Rifapentine has an antibacterial spectrum of activity similar to that of rifampin; however, on a molar basis, rifapentine and its active 25-desacetyl metabolite generally are more active than rifampin against Mycobacterium tuberculosis and more active than rifampin but less active than rifabutin against M. avium complex (MAC). The clinical relevance of activity of rifapentine against other mycobacterial species has not been established. 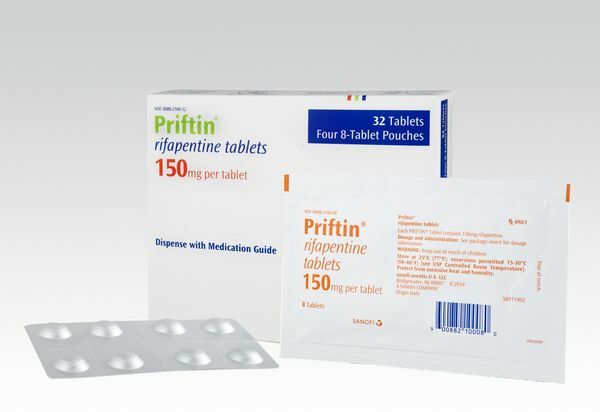 Against nonmycobacterial organisms, rifapentine is active in vitro against some gram-negative bacteria such as Brucella species, Legionella species, Neisseria species, Haemophilus influenza, Bordetella pertussis, and Bordetella parapertussis.
. Like rifampin, rifapentine also is active in vitro against Chlamydia species but not against mycoplasma. Natural and acquired resistance to rifapentine have been observed in vitro and in vivo in strains of M. tuberculosis. A high level of cross-resistance has been demonstrated between rifampin and other rifamycin derivatives such as rifapentine. Cross resistance has not been demonstrated between rifapentine and non-rifamycin antimycobacterial agents such as isoniazid or streptomycin. For additional information until a more detailed monograph is developed and published, the manufacturer’s labeling should be consulted. It is essential that the manufacturer’s labeling be consulted for more detailed information on usual cautions, precautions, contraindications, potential drug interactions, laboratory test interferences, and acute toxicity. Rifapentine is administered orally. Since the incidence of some adverse effects (e.g., vomiting, nausea, or GI upset) may be increased during fasting conditions, administration of rifapentine with food may be useful in patients with a history of such disorders. GI absorption of rifapentine is reduced (e.g., by 20-32% in the fasted state) in HIV-infected patients compared with healthy adults, but concomitant administration with food can increase the extent of GI absorption of the drug. Rifapentine usually is given once or twice weekly, and the manufacturer recommends an interval of not less than 3 days (72 hours) between doses. In the treatment of clinical tuberculosis, rifapentine should not be given alone. The drug is considered a first-line agent for use in intermittent regimens in patients with pulmonary tuberculosis. Therapy for tuberculosis should be continued long enough to prevent relapse. The minimum duration of treatment currently recommended for patients with culture-positive pulmonary tuberculosis is 6 months (26 weeks), and recommended regimens consist of an initial intensive phase (2 months) and a continuation phase (usually either 4 or 7 months). However, completion of treatment is determined more accurately by the total number of doses and is not based solely on the duration of therapy. The manufacturer states that the usual dosage of rifapentine for the treatment of pulmonary tuberculosis is an initial intensive phase of 600 mg of rifapentine twice weekly for 2 months in conjunction with other appropriated antituberculosis agents (e.g., isoniazid, pyrazinamide, ethambutol, streptomycin) followed by once-weekly administration of rifapentine (600 mg) and isoniazid for 4 additional months. The manufacturer also recommends concomitant administration of pyridoxine (vitamin B6) in those who are malnourished, predisposed to neuropathy (e.g., alcoholics, diabetics), and in adolescents. The American Thoracic Society (ATS), US Centers for Disease Control and Prevention (CDC), and Infectious Diseases Society of America (IDSA) currently do not recommend use of rifapentine during the initial intensive phase of tuberculosis treatment. However, these experts suggest that patients with pulmonary tuberculosis who have negative sputum smears at completion of an initial phase of treatment may receive rifapentine in conjunction with isoniazid for the continuation phase. When this regimen is used, the ATS, CDC, and IDSA recommend that adults and children 15 years of age or older receive rifapentine in a dosage of 10 mg/kg (600 mg) once weekly in conjunction with isoniazid (15 mg/kg [900 mg] once weekly) for 4 months (18 weeks). While the half-life of rifapentine is prolonged in patients with mild to severe hepatic impairment, accumulation of the drug in patients receiving intermittent dosing (recommended once or twice weekly dosing) is unlikely. Results of a pharmacokinetic study in patients with hepatic dysfunction indicate that no dosage adjustments appear to be necessary in these patients, and the manufacturer makes no specific recommendations. The effects of renal impairment on the elimination of rifapentine have not been evaluated. Studies using radiolabeled rifapentine indicate that 17% of a dose of the drug is excreted in urine, suggesting that renal impairment may not substantially affect elimination of the drug. The manufacturer makes no specific recommendations regarding dosage adjustments in patients with impaired renal function. Known hypersensitivity to rifapentine, other rifamycins (e.g., rifampin and rifabutin), or any ingredient in the formulation. Because multiple-drug antituberculosis regimens, including those that employ a rifamycin, can cause adverse hepatic and hematologic effects, liver function (hepatic enzymes, bilirubin) and hematologic status (complete blood cell and platelet counts) should be monitored at initiation of rifapentine therapy. Patients should be seen at least monthly during continued rifapentine therapy and questioned concerning adverse reactions; those reporting abnormalities should have follow-up, including laboratory monitoring, as necessary. Patients should be advised to contact their clinician immediately if they develop fever, loss of appetite, malaise, nausea and vomiting, darkened urine, yellowish discoloration of the skin and eyes, and/or pain or swelling of the joints during rifapentine therapy. Routine laboratory monitoring for drug-induced toxicity in patients with normal baseline tests generally is not necessary. However, if rifapentine is considered for use in patients with preexisting liver function abnormalities and/or liver disease, the drug should be used only if clinically necessary and with caution and close medical supervision; in addition to baseline tests, careful monitoring of liver function (particularly aminotransferases) should be repeated every 2-4 weeks during continued therapy. If signs or symptoms of liver disease develop or worsen, rifapentine should be discontinued. Hepatotoxicity of other antituberculosis agents that may be used in conjunction with rifapentine (e.g., isoniazid, pyrazinamide) should be considered. Clostridium difficile-associated diarrhea and colitis (also known as antibiotic-associated pseudomembranous colitis) has been reported rarely during or following discontinuance of therapy with other rifamycins, including rifampin, and should be considered in the differential diagnosis of patients who develop diarrhea (particularly if severe or persistent) in association with rifapentine. If C. difficile-associated diarrhea and colitis is suspected, rifapentine should be discontinued and the patient should be treated with supportive and specific treatment as indicated. Mild cases may respond to discontinuance of the drug alone, but diagnosis and management of moderate to severe cases should include appropriate bacteriologic and other (e.g., identification of clostridial toxins) studies, and treatment with fluid, electrolyte, and protein supplementation as indicated; sigmoidoscopy (or other appropriate endoscopic examination) usually is reserved for special situations. If colitis is moderate to severe or is not relieved by discontinuance of rifapentine, appropriate anti-infective therapy (e.g., oral metronidazole or vancomycin) should be administered. Isolation of the patient also may be advisable. Agents inhibiting peristalsis are contraindicated in these patients. The possibility that rifapentine may share the toxic profile of rifampin also should be considered. General Precautions Patients should be advised that rifapentine, like other rifamycins, may impart a red-orange color to urine, feces, sputum, sweat, saliva, CSF, tears, breast milk, and tongue; patients should be informed of this possibility. Contact lenses or dentures worn during rifapentine therapy may become permanently stained. Caution is advised if the drug is administered in nursing women. The safety and efficacy of rifapentine in pediatric patients younger than 12 years of age have not been established. Careful titration of dosage is recommended because of the greater frequency of decreased hepatic, renal, and/or cardiac function and or concomitant disease and drug therapy in geriatric individuals. Rifapentine induces microsomal enzymes (i.e., cytochrome P-450 [CYP] 3A4 and 2C8/9 isoenzymes) responsible for the inactivation of a number of drugs including certain calcium-channel blocking agents (e.g., verapamil, diltiazem, nifedipine), certain antifungals (fluconazole, itraconazole, ketoconazole), opiate analgesics (e.g., methadone), oral antidiabetic agents (e.g., sulfonylureas), corticosteroids, cardiac glycosides, certain antiarrhythmic agents (e.g., disopyramide, mexiletine, quinidine, tocainide), certain anti-infectives (e.g., quinine, dapsone, chloramphenicol, clarithromycin, doxycycline, fluoroquinolones), certain reverse transcriptase inhibitors (e.g., delavirdine, zidovudine), certain immunosuppressants (e.g., cyclosporine, tacrolimus), and oral anticoagulants (e.g., warfarin). Concomitant use of rifapentine and any of these drugs may result in decreased plasma concentrations of the drugs, and dosage adjustments may be required. Concomitant use of rifapentine also may diminish the effects of barbiturates, anticonvulsants (e.g., phenytoin), benzodiazepines (e.g., diazepam), clofibrate [no longer commercially available in the US], theophylline, β-adrenergic blocking agents, haloperidol, levothyroxine, sildenafil, and tricyclic antidepressants (e.g., amitriptyline, nortriptyline); dosage adjustments of these agents also may be required. Induction of cytochrome P-450 hepatic microsomal enzymes by rifapentine generally occurs within 4 days after the first dose and returns to baseline levels 14 days after discontinuing the drug. The magnitude of hepatic microsomal enzyme induction by rifapentine is dose- and dosing frequency-dependent; less enzyme induction occurs when 600 mg of rifapentine is given once every 72 hours versus daily administration. In vitro and in vivo enzyme induction studies have suggested that rifapentine induction potential may be less than that of rifampin but greater than that of rifabutin. Because rifapentine has been shown to increase metabolism of HIV protease inhibitors, which may result in subtherapeutic plasma concentrations of these antiretroviral agents, rifapentine should be used with extreme caution, if at all, in HIV-infected patients taking these drugs. Patients should be advised that the reliability of oral or other systemic hormonal contraceptives may be affected by concomitant rifapentine therapy, and consideration should be given to using alternative contraceptive measures. In a large, international controlled trial, patients were advised to take the drug at least 1 hour before or 2 hours after ingestion of antacids. However, since no specific drug interaction studies have been performed, it is unknown whether an interaction between rifapentine and antacids exists.